Click on the pictures; some of them have additional information. 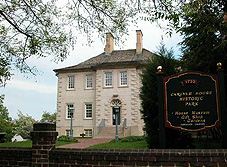 Home of John Carlyle in Alexandria where Gen. Braddock met with five colonial governers before beginning his campaign. Fort Cumberland was located on the Maryland side of the Potomac River at Wills Creek. It was the final staging point for the army. Sign on Rt. 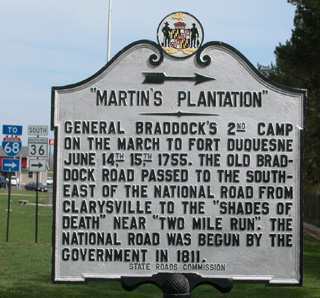 40 at east end of Frostburg for second camp at Martin's Plantation. 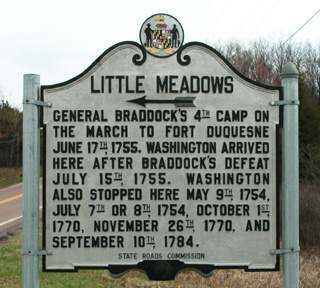 Sign in Maryland on Rt 40 for Braddock's fourth camp at the Little Meadow. 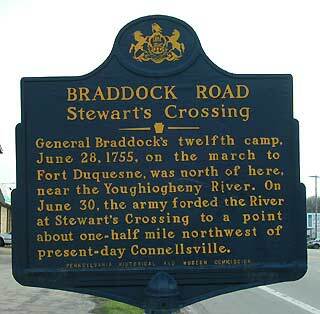 From this point on the army moved as two units with Braddock and the lighter soldiers moving ahead. 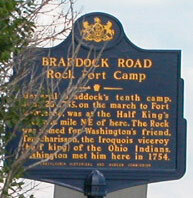 Braddock's tenth camp at Rock Fort. 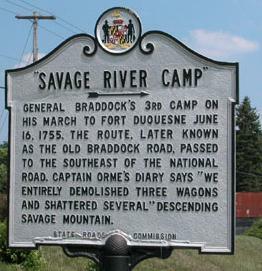 Sign at junction of Rt 40 and road to Jumonville Glen. 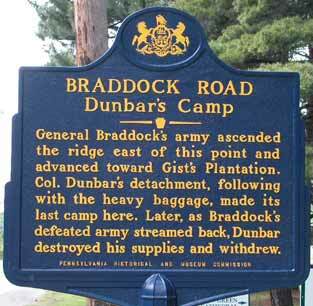 Dunbar's' camp was the last camp of the heavier supply train lead by Col. Dunbar. 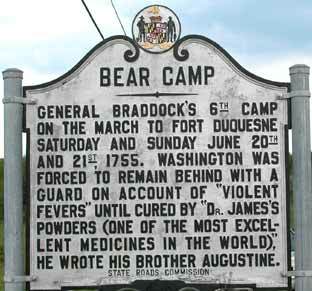 It is just north of Jumonville Glen where it all began. 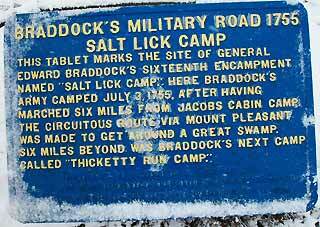 Gen. Braddock's twelth camp near Stewart's Crossing. 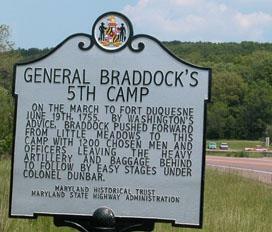 Gen. Braddock's sixteenth camp just south of present day Mt. Pleasant. 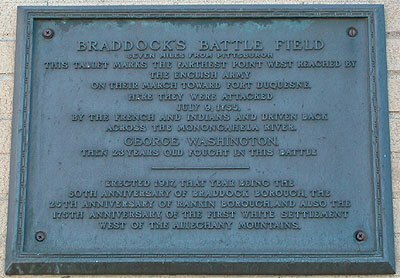 Sign on Library Street in Braddock, PA at ball field now atop the scene of Braddock's defeat. 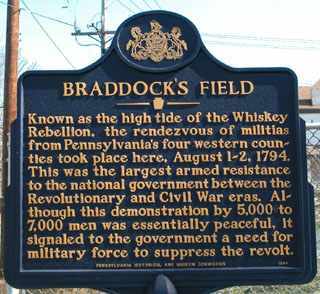 The field was used years later during the Whiskey Rebellion. 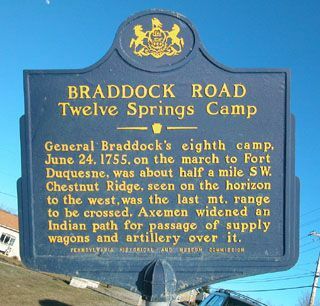 Gen. Braddock's new grave located along Rt. 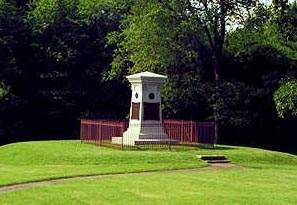 40 west of Fort Necessity; it is a short way away from the old road under which he was originally buried.